The annual Spring Egg Hunt is coming up on Saturday starting at 10am sharp at the Laurelhurst park for ages 12 and under. Over 4,000 plastic eggs stuffed with toys, stickers and candy will be scattered, as well as treats. Some eggs will have a special ticket to win a prize basket or other surprise. Kids are divided by age group. Following the event there will be field games. 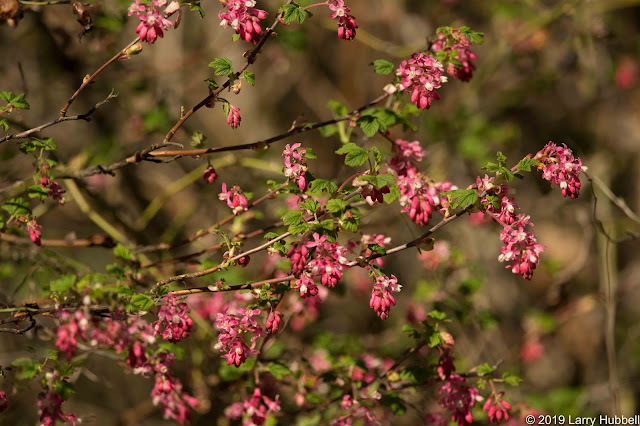 Hop on over for a family fun spring tradition in the Laurelhurst neighborhood! Be sure to bring your basket to hunt for eggs and special prizes. Help support our can food drive to assist our local food bank and our bake sale (cash or check only) to support the community center programs. Plan to arrive no later than 9:45 a.m.
A blue Huffy mountain bike with no kick stand and loose seat appeared in our front yard on the 4500 block of 48th Avenue NE. We would like to return it to the owner. Please email laurelhurstblogger@gmail.com for information. Children's Hospital has begun construction activity in preparation for the new Building Care, Forest B, Phase 2 of the expansion, planned to open in Spring of 2022. 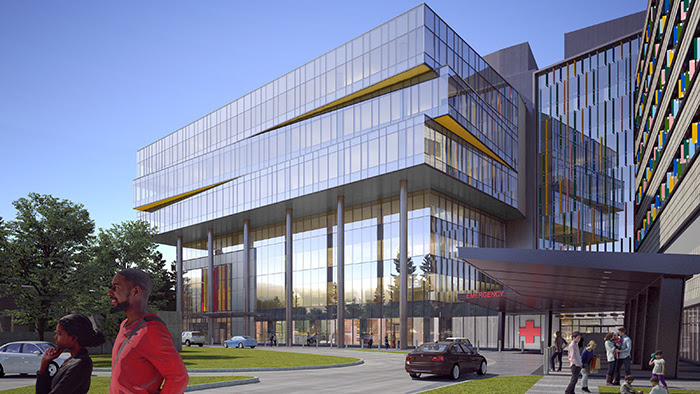 The 310,000 square-foot addition will add an eight-story building and will includes diagnostic and treatment facilities, primarily out-patient cancer and others) labs, new state-of-the-art operating rooms, 20 inpatient beds, and a lobby. There will be two floors of underground parking and sterile processing. This will bring SCH bed total to 409, up from 200 before its expansion 2012 plan. The helicopter landing pad has already moved temporarily to the roof of Forest A (176’), now known as Friends of Costco Building, Phase 1 of the expansion. The landing pad will be active for the next four years, until Building Care is completed Noise is expected to be louder than the former ground-based helipad. When Forest B is complete, the helistop will moves to its permanent location on top of the Friends of Costco Building (same height). Construction noise will be generated throughout the week. Construction activity is weather-dependent and subject to change based on conditions. All work will take place within standard construction hours: 8-6pm and 9-6pm on Saturday. Call 206-987-8000 or email construction@seattlechildrens.org with questions. NEST (Northeast Seattle Together), which supports Northeast Seattle elder neighbors through a network of volunteers and vendors, is having a presentation today at 2pm called "Storm Warning: Historic Weather in the Evergreen State." The event is being held at the Magnuson Park Brig (6344 NE 74th Street) in the Garden Room. Local broadcaster and historian Feliks Banel explores our region’s darkest weather days and most infamous storms. With archival photos, radio, and TV clips, Banel takes us back in time to hear stories of those who survived some of the worst Pacific Northwest weather in recorded history. Further, Banel explores how these storms can revive our shared humanity. Frightening weather can bind communities together to share resources, commiserate, and protect each other. Participants are encouraged to share their own memories of how they survive being snowed in, washed out, or left without power in the wake of a big storm—and why we remember those moments for the rest of our lives. Feliks Banel is a writer and producer, and serves as editor of COLUMBIA, the quarterly magazine of the Washington State Historical Society. He has been a host and contributor for KIRO Radio on matters of Northwest history and culture for many years; he created the history series This NOT Just In for KUOW Public Radio; and he produces documentaries for the Seattle Channel. For more information go here or call the NEST office at 206-525-6378 or email info@nestseattle.org. NEST is a non-profit grassroots operation serving NE Seattle seniors by creating a "virtual village" to helping them be able to stay in their own homes and neighborhoods they love. Volunteers provide companionship, care, as well as help seniors with a wide range of services, including gardening, computer help and more. to seniors aging in their homes. Ongoing classes (fitness, etc) are also offered, as well as access to events, transportation services, and various services (such as estate planners) who provide their services at a discount to members. The Laurelhurst Blog staff will be on vacation next week and will return to posting on Monday, the 15th. In the meantime, please keep sending in your informative emails and we look forward to responding. Seattle Parks and Recreation is celebrating Earth Day in partnership with Green Seattle, on Sunday. 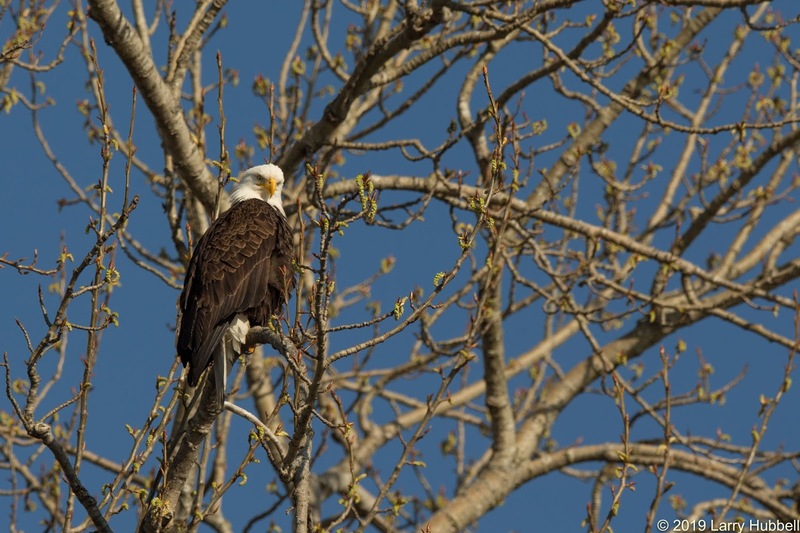 8-11am - join Friends of the Burke-Gilman Trail for their monthly Bird Walk and Citizen Science project. All ages and experience levels welcome. Woody, Wheeler, Master Birder and author will lead our walk. 9:30-12:30 Magnuson Reforestoration - Help create and improve thriving forest habitat on what was once a denuded and sterile navy airfield.. It will create healthy forest habitat and increase beneficial ecosystem services including provision of human enjoyment and health. It is also an opportunity to enjoy nature and learn a bit about native plants while doing satisfying work. Advance approval of leader is required for youth groups or children below high school age. April is Earth Month, an annual celebration and appreciation of our beautiful planet, and a chance to have fun and give back while getting some fresh spring air. Join Seattle Parks and Recreation and our partners at one of the many volunteer Earth Month events happening across Seattle. You can get your hands dirty and help revitalize a much-loved park or look for wildlife along trails bursting with new growth. Volunteer activities include nature walks, gardening, trail repair, mulching, cleanup, planting, weeding, invasive species removal, nature exploration, and much more. More volunteer opportunities are listed on the Green Seattle Partnership’s event calendar here. The Laurelhurst Blog received this information from several residents about contractors adhering to City policies regarding noise and parking. How about a friendly reminder to help neighbors get through remodeling projects in Laurelhurst. Ask your Contractors and workers not to park on the side of the street where a sign says “No Parking”. Many streets are lined with large trucks that you can barely pass by and curbs are usually left with broken concrete. Garbage trucks and or Delivery trucks can not pass by. Contractors and workers please, "Do not block driveways." Morning start time for any workers should not work earlier or later than City code allows. For those of you having contractors or other delivery people using the alleys, please have them keep a person immediately nearby to move their vehicle. There have now been multiple times where the alley has been blocked on both ends, with no one near the vehicles. This has forced us to be late picking up our kids at school and would be dangerous if there was an emergency situation. Section 11.74.010: No person shall stop, stand or park a commercial vehicle or a vehicle displaying a valid commercial loading permit in any alley for any purpose or length of time other than the expeditious unloading and delivery or pickup and loading of property and then in no case shall such parking for loading and unloading of property exceed thirty (30) minutes. For more information on Seattle Municipal Codes go here and here to file a complaint. 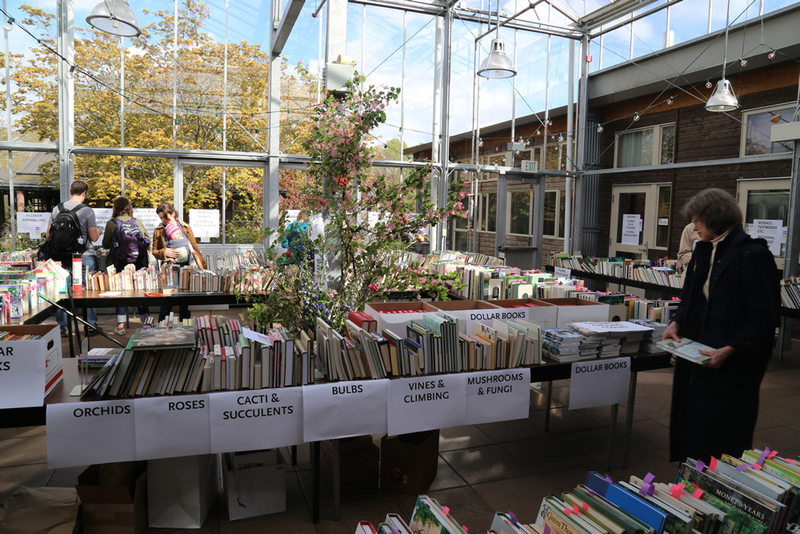 The 14th annual Garden Lovers' Book Sale of used books at the Center for Urban Horticulture(501 NE 41st Street), benefitting the Elisabeth C. Miller Library funds, which is used to purchase new books and magazine subscriptions, is happening this week-end. The fundraiser starts tomorrow from 5-8pm with a party and auction for $25 in advance or $30 at the door). Wine and light refreshments will be served, along with the opportunity to browse the selection of used gardening books. The Saturday sale is free and open to the public from 9-3pm. The Pacific Northwest Botanical Artists will have an exhibit and sale of prints and cards through May 8. The Seattle Police Department invites you to a community meeting regarding the shooting incident on Sand Point Way. Seattle Police command staff will be there to relay any authorized updates and discuss first responder deployment. A Laurelhurst Elementary School 2nd grade teacher was one of two victims that survived the shooting and is reportedly still in the Hospital. 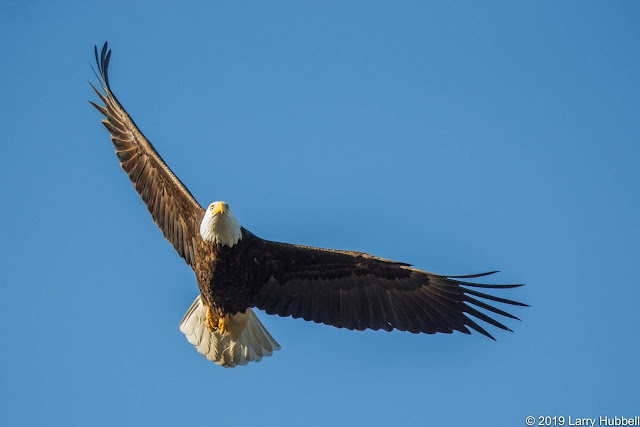 Here is a recent post from the Union Bay Watch Blog published by Larry Hubbell, long-time local photographer and birder. Here also is an in-depth article about Larry and his work. 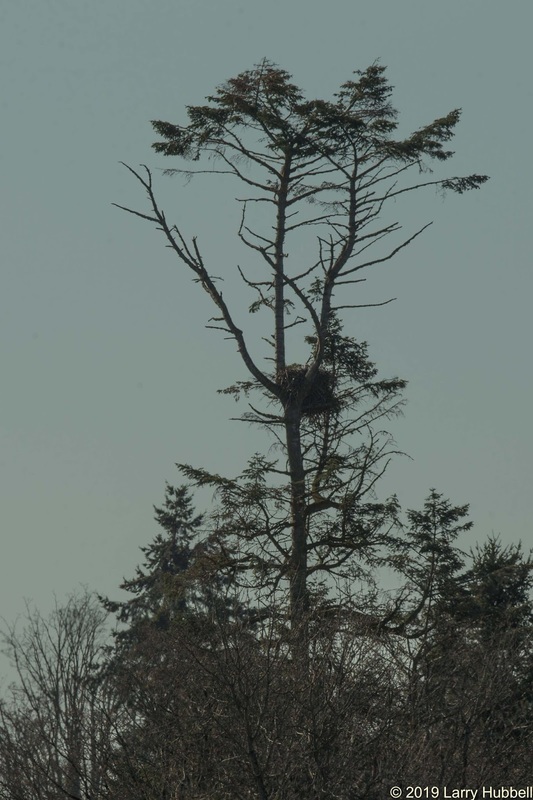 During the first week of March, I noticed Eva and Albert, the Broadmoor Bald Eagle pair, perched above Duck Bay. They appeared to be enjoying the sunshine and each other's company. My best guess is, they were actually considering adding waterfowl to their morning menu. Further to the northwest, Monty and Marsha were also sitting in the sun. The Montlake Cut pair were relaxing just beyond the invisible border which divides their neighboring territories. My impression is that the border aligns fairly close to the eastbound 520 on-ramp which originates in the Arboretum. 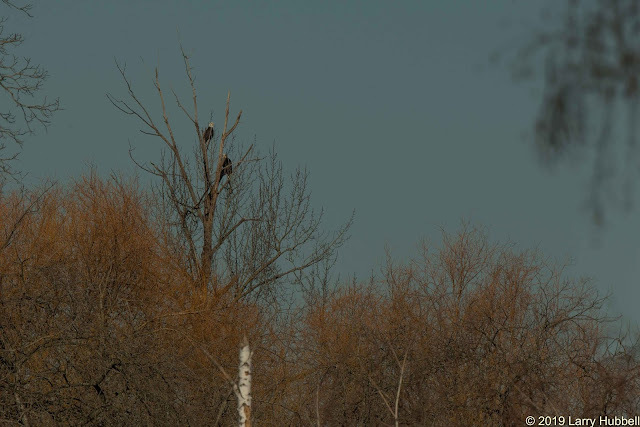 During fall and winter, it is common to find our local eagles paired-up and sitting quietly side-by-side. However, as the increasing solar intensity burns winter away, the local eagle behavior begins to change. Between now and autumn, there will not be many opportunities for the Eagles to get away from their nests and share relaxing moments sitting in the summer sun. This is Monty and Marsha's new nest. 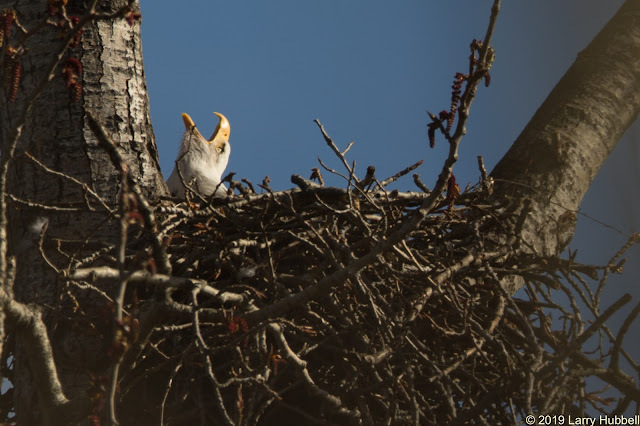 It is about six feet below their original nest, which began to crumble last July. From our earthbound perspective, this new nest may look empty. I suspect it is not. The nest building, which we saw in last month's post, has virtually stopped. The nest has grown. It now appears to be fairly well-balanced and hopefully secure. 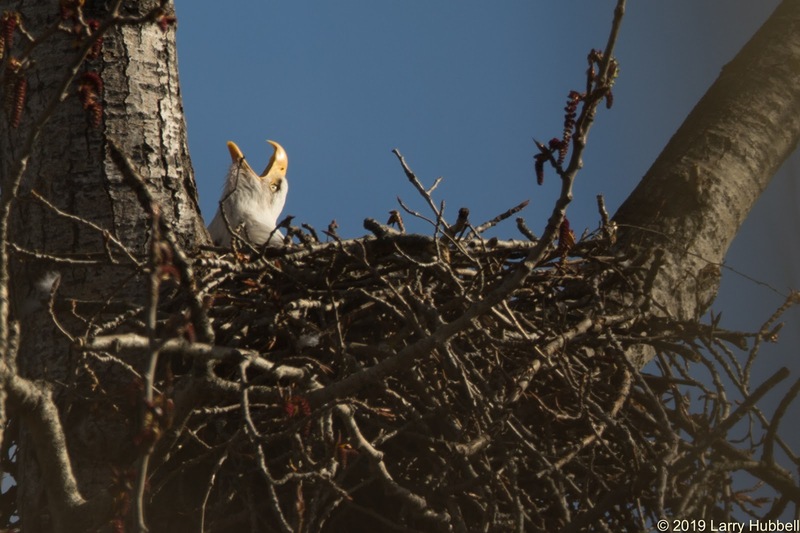 If you look closely you can faintly see small patches of white showing through the upper right portion of the nest. I believe this hint of white is reflecting from the feathers on Marsha or Monty's head. 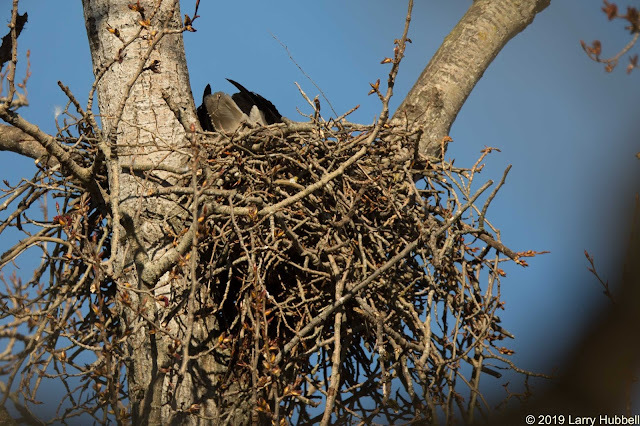 On Tuesday, I first noticed what looked like nesting activity. From this angle, it seems obvious that one of the eagles has its head down in the middle of the nest, while the tips of its folded wings are pointed outward. I wondered what the eagle was doing? Was it simply adjusting the placement of a stick in the nest? On Thursday, I caught a similar view. The nagging question in my mind was, had incubation begun? 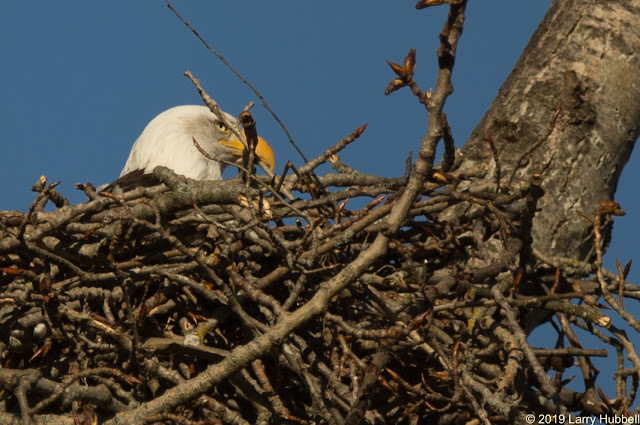 Was the eagle turning eggs to keep them uniformly warm? All I knew for certain was the eagle was focusing inward toward the middle of the nest. 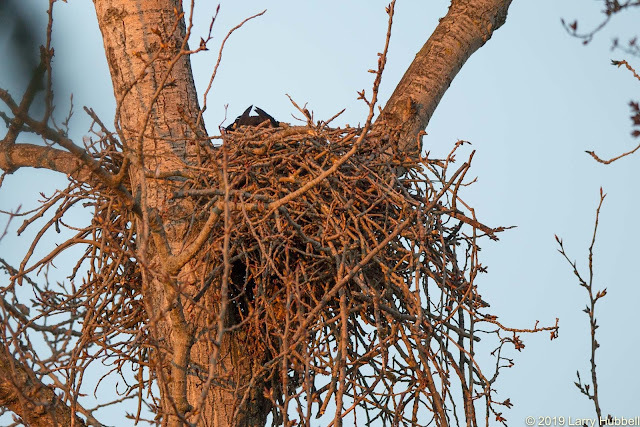 Twenty minutes later, with her identifiable head showing, I could at least be positive that I was seeing Marsha in the nest. Marsha's white head has a uniquely grayish-brown cast behind and below her eyes. This close-up clearly displays her distinctive facial coloring. A few moments later Monty arrived. When he landed just above the nest, Marsha abandoned her post and Monty took over duties in the nest. I have no way to actually see eggs in the nest, however, their clear exchange of roles convinced me that Monty and Marsha have initiated the parental process once again. 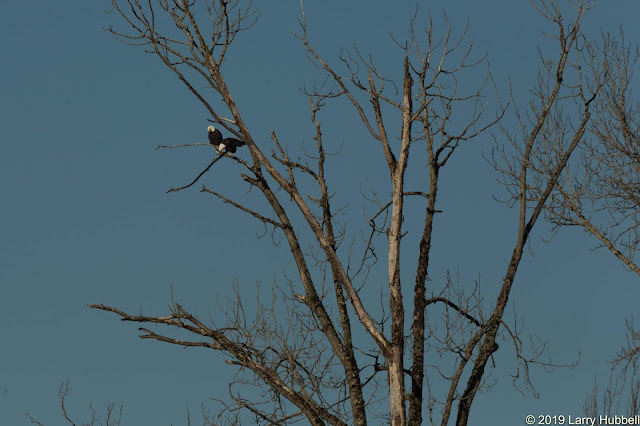 Yesterday, Monty appeared to be on-watch just a couple of trees away from the nest. Marsha, on the other hand, was in the nest and voicing her displeasure with the crows overhead. It seems obvious, she is using her body to defend and protect eggs in the nest. During the last year, Monty and Marsha seem to have learned a lot. 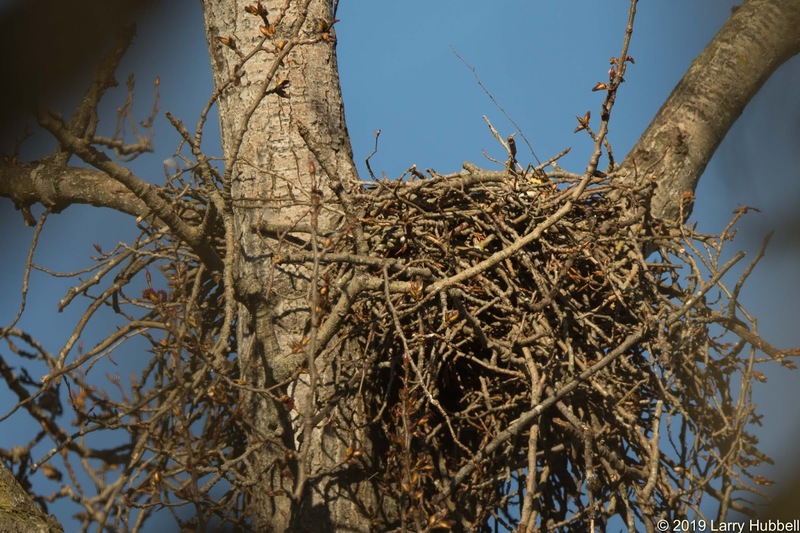 The new nest is in the largest fork in the tree. 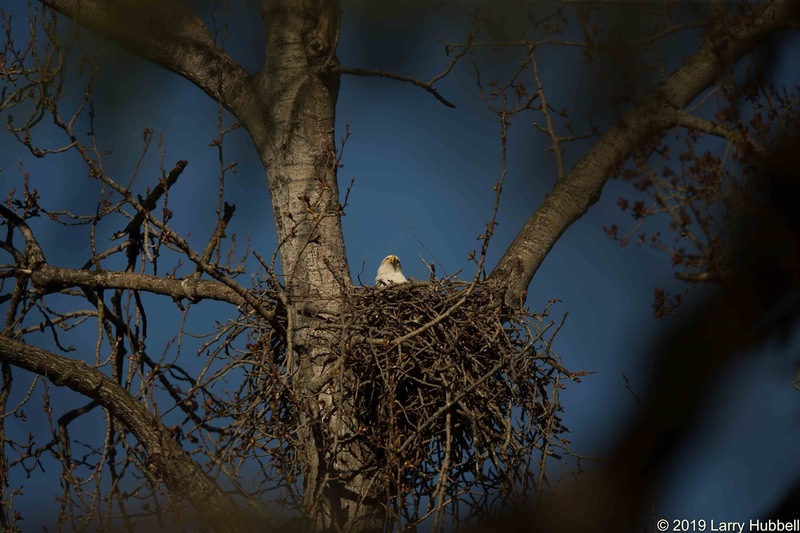 The nest was started and completed about three weeks earlier than last year's nest. The timing of their egg-laying and incubation appears to be impeccable. Although it is distant and difficult to see, one the of the Broadmoor Bald Eagles (Eva I presume) looks like she is also on eggs in her nest. Last year, I believe I first noticed Eva appearing to be on eggs on March 23rd. It sure looks like both nests are on a very similar schedule this year. 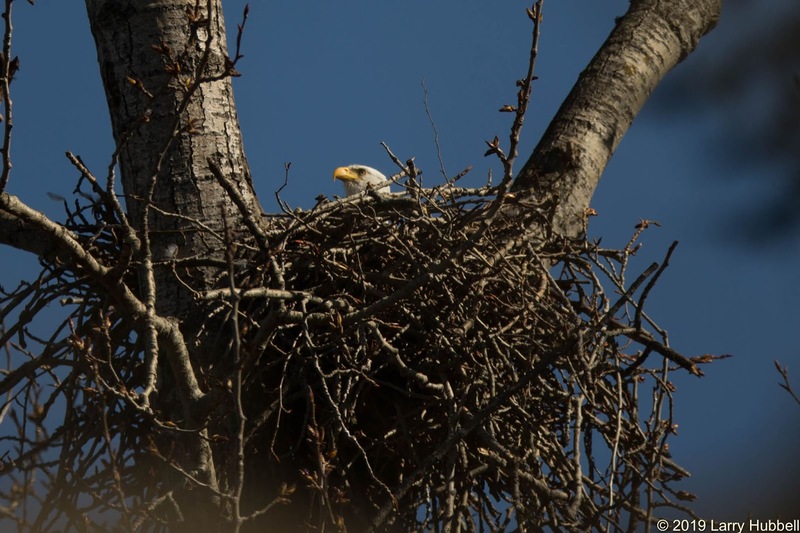 Given that it will take just over a month for the eggs to hatch, plus a week or two for the young to grow large enough to stand and be visible from the ground, I am estimating our first sighting of young eagles will be in the first or second week of May. If everything continues as expected, that would mean the young will be likely to be leaving the nest sometime in July. Wouldn't it be wonderful if one of their offspring learned to fly on Independence Day? In the comments to last week's post, The Mythical Ravens, Ann recently wrote about seeing three ravens in Montlake this week. I am seeing one or two almost every day and very excited that they are still hanging around. Finding out about a third raven in the area triples the excitement. We're a blog about neighborhood news, events, issues, restaurants, businesses and lots more. If you have a story idea, know or see something interesting, please let us know at laurelhurstblogger@gmail.com.